HELP CREATE THE NEXT EARTH DAY 2019 DESIGN! Earth Day is right around the corner, so here’s a chance to teach your students about the importance of environmental conservation while also letting them exercise their creativity. We want YOUR STUDENTS to create artwork for our next Earth Day screenprinted t-shirt design. Simply scan or take a photograph of their environmentally themed designs and submit it through the entry form below. Submissions will be accepted until December 7, 2018. 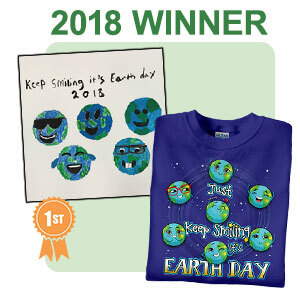 The winning design will be picked by EarthDayShirts® and announced on December 14, 2018. T-Shirts will be printed and shipped in time for Earth Day 2019. • Submit only original artwork. • Do not use any trademarks or copyrighted images in your design. • This is a classroom project, so no outside submissions will be accepted. • There is NO LIMIT to the number of designs your class can submit. • The classroom size limit for distribution of t-shirts is 50. • We reserve the right to alter the winning design before printing and advertising. • Shirt colors will be determined by EarthDayShirts®. • By entering, you agree to our Legal Terms and Conditions.